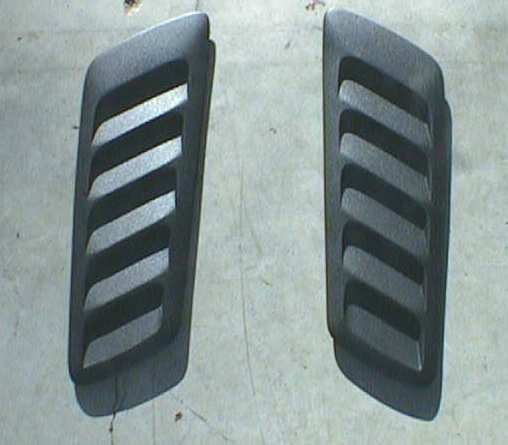 The louvers I am using come from a 1994-96 Pontiac Grand Prix GTP. (I haven't checked yet if this vehicle, and the spare parts for it, are available in Oman -- Laurie) These are functional hood louvers and are made out of a high temperature resistant Nylon. 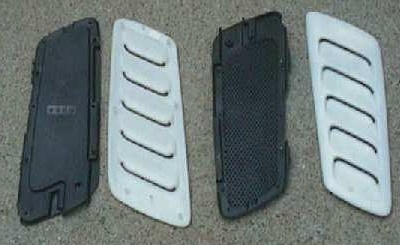 Here is a picture of the Louvers (top and bottom, and the drip pans) as they come from the Pontiac dealer. As you can see the vents come snow-white nylon and have to be painted. I used DupliColor “Bumper Black” as it contains a flex agent that should allow for expansion and contraction without harming the paint. Here is what they looked like after painting. I did put the nylon louvers in my bead-blasting cabinet for a few minutes to rough them up some prior to painting. I did not use any primer or other flex agent, other then the Bumper Black rattle can stuff. So far the paint is holding up well. If you are unable to find these parts in Oman, I'm sure other Louvers could be used, but you could obtain the parts from this website: http://www.parts.com - just enter the part numbers you need. 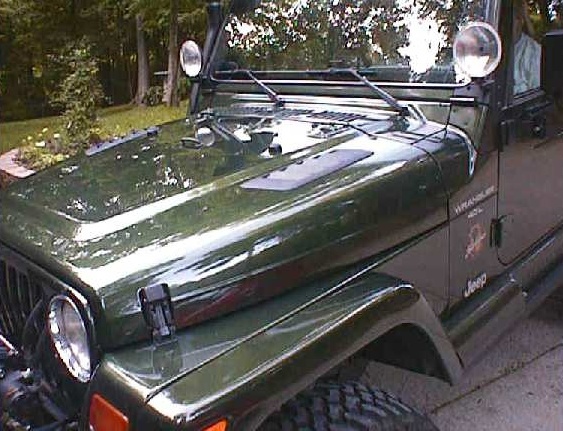 Once I knew the area I wanted to install the louver at I made a template to match the underside of the louvers so I could mark the holes I needed to cut in the hood of my Jeep. Note: If I can come up with a way to replicate this cardboard template, I will do so and would be happy to send them out to folks if you have an interest. Let me see what I can do with it first. I covered the hood on both sides with masking tape so that I could trace the template out on the hood in the proper location on both side. Here is a picture of the template in place ready to be traced. Please Note, it is the inside edge of the template that gets traced, as well as the holes that mark the drill locations. The outside edge of the template represents the outside edge of the louver when it is installed. Please take note of the two nickels and the long piece of blue marking tape. 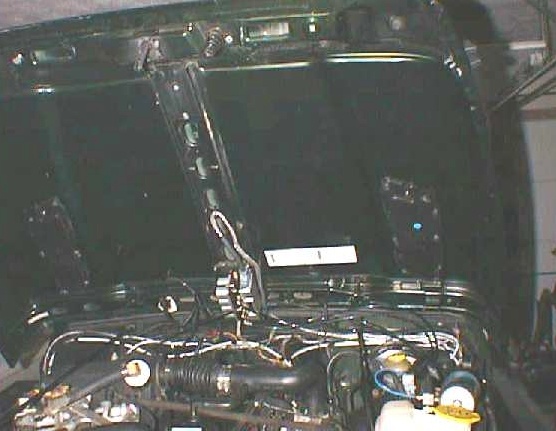 The blue tape is exactly 20.75-inches (20 and ¾-inches) from the rear edge of the hood. This is important. This places the front edge of the louvers. 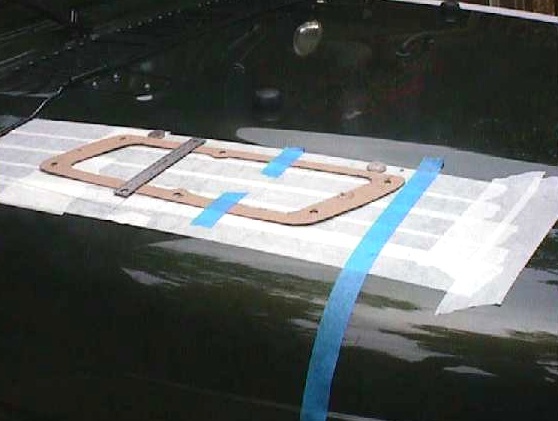 If you do this, DO NOT go less then 20 and ¾-inches or you will have a clearance issue inside the hood with the bracing on the rear edge of the hood. The two nickels where used to space the template (and louver) away from the curvature of the hood where it bumps up. Just lay the two nickels down and push them up to the curve while allowing the nickels to remain level and NOT ride up the curve. This will mark one edge of the template (and louvers) for you. Tape the template down and then trace the inner section on the tape. Be sure to trace and mark the eight (8) holes that you will have to drill to mount the louvers through the hood. 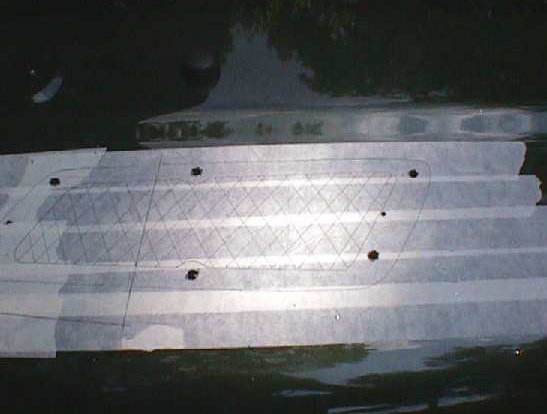 Here is a picture of the template traced on the masking tape and the eight holes (6 are 5/16-inch and two locating holes are 1/8-inch) drilled in my hood. You can also see I marked the section that needs to be cut out with a criss-cross pattern so even if I where having a blonde day it would be difficult for me to screw up! Piece of advise. 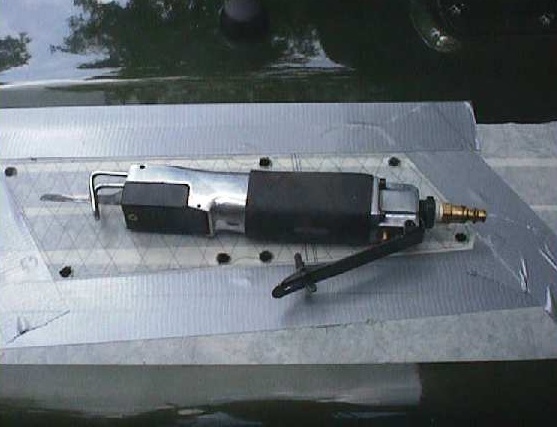 Tape and trace the template on both sides of your hood before you do any drilling or cutting. In this project you want to measure 5 times and cut only once for each louver hole. Prior to making “the big cut” on each side I drilled several pilot holes in the section of my hood that would be cut out. I also protected the hood with some duck tape to keep the vibration on the Air Saw shoe from scratching the paint. I suppose any number of tools can cut this hole out. I used an Air powered Body Saw which I have had for years. If you don’t have one maybe you can barrow one from a friend. These things cut single thickness sheet metal like a hot knife through butter, leave no distortion in the hood when done. Also, Harbor Freight sells these every day of the week for $39, but every three or four weeks they have them on sale for $20. After cutting the hole on the template line all I had to do was take a file to de-burr the edge and trial fit the louvers. They fit perfectly. I did use touch up paint on the edges that I cut. Sorry don’t have a picture of the hole. I mounted the louvers using 3M-brand Trim tape purchased at Auto Zone. This stuff is incredible. I just laid a 1/8-inch bead of tape all around the underside of the louver and put the louver in place. Tip! 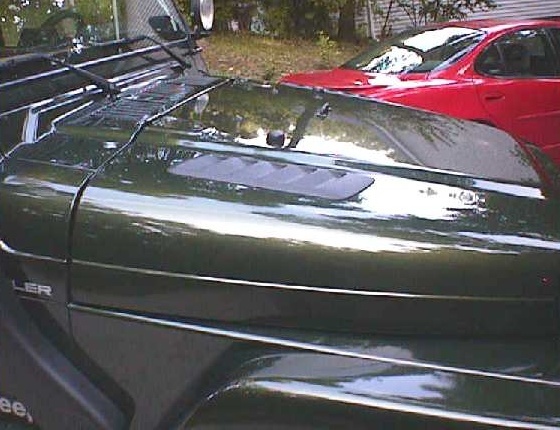 DO NOT pull the backing off the 3M trim tape until you have the louver in place on the hood. Once in place you can pull the backing off and press the louver right down. Trust me, it will not move, and you will not get it off again without sliding a knife between the louver and hood to cut the tape. 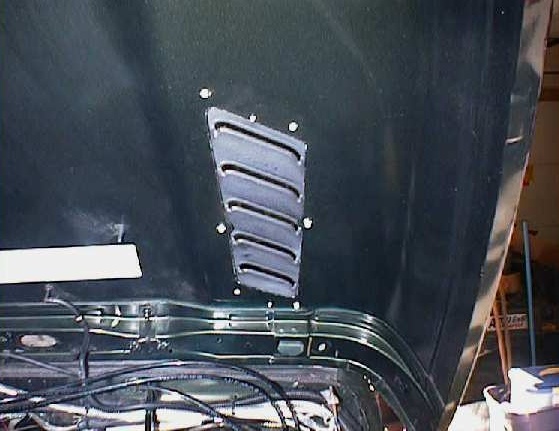 Here is a picture from under the hood at the driver’s side louver. See those little white stand-offs? The drip pan mounts to these stand-offs with screws. Here is a rather poor picture of the drip pans temporality mounted to the underside of the louvers. As I said before, the drip pans severely impact the performance of the louvers. I have mine off and they will stay off until winter. Based on the size of each louvers opening I have calculated each is the functional equivalent of cutting a 5-inch square hole on each side of your Jeeps hood. You can see the heat, and distortion cause by the heat from the drivers seat. It is not enough to hinder your vision, but it is quite noticeable. Here are two more pictures of the louvers installed.